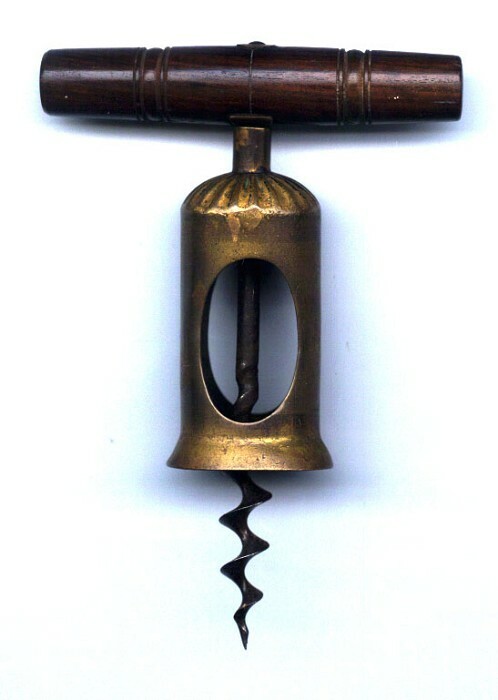 Chinnock's American patent corkscrew self-puller with brass barrel and oval windows. Sliding shaft. Crimped top of barrel. Marked on each side of barrel CHINNOCK'S PATENT, MAY 27 18__ (1862). Wood handle with square brass plate on underside around the insertion of the shaft, a Chinnock characteristic. Good patina. There is a triangular wood chip measuring 10 x 6 mm on the underside of the handle adjacent to the brass plate. US priority $5.20, Worldwide $5.00.